NC Family’s 2016 Annual Major Speakers Dinner in Charlotte, NC on October 28, 2016 featured Kellie Fiedorek, Esq., who serves as legal counsel with Alliance Defending Freedom, where she is a member of the Marriage and Family Team. Kellie has been a key player in supporting efforts to defend HB2 in North Carolina in 2016. 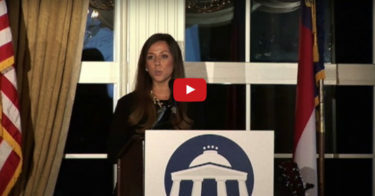 Click on the video below to watch Kellie’s keynote address at NC Family’s 2016 Charlotte Dinner.